Don't judge a book by its cover. 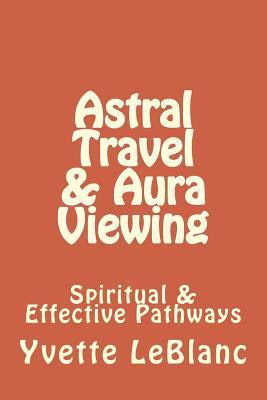 Here's why: Yvette LaBlanc's 165 page book Astral Travel & Aura Viewing has a really blah cover, and a blah title, but it's really not bad at all. Like all OBE books, there's good and bad. What I liked most about this book is its no-nonsense approach. There's almost nothing extraneous. It's all practical. She doesn't waste time or words. She spends almost no time telling stories or touting theories; it's all good information. In part one, she gives OBE definitions and preparation. It's all practical and good information. Part two, the next 82 pages, is a concise but detailed set of different OBE techniques. It's almost like a recipe book. Very few books in the genre devote that much space to techniques, and I applaud her for that. She details many techniques; lots of things to try. Some of her techniques were surprisingly new to me (although I doubt many would work on a stubborn mind like mine). I've read almost every book on OBE and studied every OBE technique under the sun, but LeBlanc has some unique new ideas. My favorite example relates to how breath is used. A few rare OBE books talk about the importance of breath control in regard to OBEs (author Robert Crookall devoted an entire book to the subject), but the subject is largely ignored by the vast majority. But in one of LeBlanc's techniques, she recommends slowing down your breath, then pausing a second or two after you exhale. During this exhale pause, you try to separate your astral from your physical body, and she says sometimes it works. Most people would be deathly afraid that their body would stop breathing. Many OBE beginners are very much alarmed when they get close to the jumping-off point and lose their awareness of their body's breathing. They think "Oh my God, my body's stopped breathing!" and abort the experience, even though it's really still breathing, but they've just lost awareness of it. Rookie mistake. LeBlanc deliberately tries to use that pause after you exhale to initiate an OBE. Of course, in order for this to work, you have to just blindly trust that your body's autonomic nervous system will take over and continue breathing while you're out-of-body. An interesting concept, and definitely worth trying. Note that you don't want to force your breath to be unnaturally slow; it needs to be a natural progression to slow breathing. It's interesting to note that my breath is naturally very slow to begin with. I projected to a crystal and moved all around it. I was tiny; it was gigantic. The experience was life altering. That's it. That's the whole experience. She doesn't say why this particular OBE was life altering. She doesn't describe what she felt or what she saw, the colors or the enormity. She doesn't set the scene or paint the picture. Why was it life altering? The reader is left to wonder. Most of her OBE accounts are like that: very short and uninspiring. It's almost enough to make me wonder if LeBlanc is the "real deal." You can just tell authors like Monroe, Aardema, Ziewe and many others have genuinely "been there" because of the way they describe the experience. I don't get that warm fuzzy feeling with this book's narratives. Regardless, I still say the book is good, and worth buying for the technique section alone. Earlier I said that there's nothing extraneous in the book, but some would argue the point because of part four. Part four is about aura viewing. If you're into auras, this is also good, practical information. It has little to do with OBE (even though she makes a good effort at tying the two together), but it's still good information about auras, and it's short enough to not be annoying. The book's title includes "& Aura Viewing" so I can't fault her for including this information. If the book was just called "Astral Travel" I'd complain about extraneous information about aura viewing. But I bought a book on "astral travel AND aura viewing" so part four is definitely fair game. I can't fault her. I'd have a problem if the aura viewing section outweighed the astral travel sections, but it didn't. It was a good size, and good information. Ms. LeBlanc needs some help with her OBE narratives, but don't let that discourage you from buying her book. I had low expectations, but was actually impressed with it. I liked her no-nonsense, lay-it-on-the-line approach to OBE. Her techniques were solid and her information was good. She doesn't beat around the bush or make you wait for the good stuff. She dives right in and tells you how to approach the OBE. There are better OBE books out there, but I still give it a thumbs up. Thanks for the review. I will definitely check this book out.